I feel like I was barely at Hip Hop yesterday. I suppose that's ok. I mean, I am a bit busy with being pregnant and having Brady and all. I miss my friends though. Love those girls! Unity has some amazing fans! Angela is having some huge deals this week! Check out the Unity site for details! I'm sharing a couple Unity cards I made this week. The first one is for last Sunday's featured stamper, Mercy Kerin. You can see the card I CASEd HERE. I simplified this a bit. I left off layers and embellishments. I changed the stamp set and of course the paper. I put some Stickles on the bee (the black stripes and the wings) and added some little dew drops. This card uses Unity's Everyday Adorable set which I just love. Two of my friends (Lindsay and Tanis) created this set. It's just super cute and I love it! My next card is for Dustin's birthday. It's from Brady. :) I don't know how I'm gonna make a card from Parker, but we'll see. I am in LOVE with this Unity set! It's called Little Me. I just think it's ADORABLE! There are mommy/girl images too but this one just steals my heart. Something about a little boy and his daddy. The words are from Unity too, I got them out of a grab bag so I'm not sure what set they are from. I hand wrote the B behind the sentiment. This is a sketch from the Stampin Out Alzheimer's event as well. There's some amazing inspiration over there! And some awesome giveaways! Hope you all are over there checking it out! I'm lovin your bee cards girlie! And that card from Brady is tooo sweet! I've eyed that stamp set before too, but with no kiddos, I guess I wouldn't get much use out of it! But sooo cute! two great cards, Ashley! nice clean layouts and nice fun colors. Happy HHH Day to you!!! Love your cards & the stories behind the cards!!! Both of those sets are heading to my door ~ so thank you for the inspiration!!! those are just so cute Ashley... I can't wait to get that Everyday Adorable set... I ordered it Wednesday! Great cards girl! Love that bee one! Hang in there! love your cards.. so cute! They are awesome! 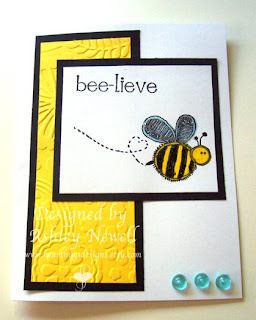 Ashley this bee card is adorable and just love the layout and cards. 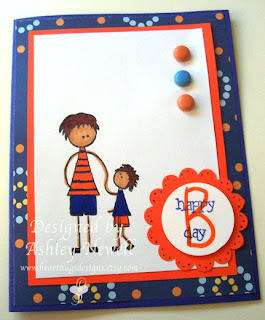 Now Brady's card is just the cute and love the bright colors. Thanks for the inspiring eye candy. CUTE cards Ashley! Love that boy and his Daddy card! Love these cards!! so bright and fun! Missed you yesterday! But you need to rest as much as you can now! Both of these are really cute great job!! ahh both are so cute! Very cute bee card - love the second card too! You are very talented! I love that birthday one. So festive! Two stinkin cute cards! Hang in there and enjoy these last days of your pregnancy! 2 BEAUTIFUL cards!!! I always love to see your art Ashley. Sweet cards Ashley! Love the colors used too! love the cards, they are so sweet! I can't wait to get these two sets! The Brady card is sooooocute Ashley! super cute! way to rock the layers. Great job on both cards Ashley!! Hang in there girl... you are almost there!! Both cards are very cute, but I'm partial to the bee card. Cute cards Ashley! I just hate it when I can't spend as much time as I want at Hip Hop! I only have work as an excuse. You are holding up so well. I keep waiting to hear that you have had the baby!